To Cite: Papp M, Nadianmehr B, Bodo G, Racz O, Molnar P, et al. Retrospective Analysis of Idiopathic Hip Osteoarthritis Based on Anteroposterior Pelvic Radiograph; Hip Osteoarthritis Caused by Femoroacetabular Impingement, Trauma Mon. 2017 ; 22(2):e35374. doi: 10.5812/traumamon.35374. Background: Femoroacetabular Impingement (FAI) means pathological impact between the femoral head-neck junction and the acetabular rim. Objectives: The aim of this retrospective study was to analyze Femoroacetabular Impingement (FAI) signs, which can lead to idiopathic hip osteoarthritis, from preoperative radiographs of patients indicated for total hip replacement as compared to radiographs of patients without this indication. Methods: We examined the preoperative anteroposterior (AP) pelvic radiograph, the pincer and cam FAI signs of patients between 45 and 60 years, who had undergone total hip replacement. We examined in the same group, the operated side and the non-operated hips with osteoarthritis (patients group). In the control group we examined the pelvic radiograph of patients without symptoms between 45 and 60 years old (control, group). Results: In the patient group (215 patients, 313 hips) we noted the signs of FAI in 88% while in the control group (112 patients 224 hips) these signs were found in 8.8% of cases. Hip osteoarthritis is divided into two main categories. Secondary hip osteoarthritis is caused by different childhood or adult conditions (Table 1). Regardless of the age of the patients, trauma can lead to secondary hip osteoarthritis (1). Hip osteoarthritis manifesting without these conditions is primary or idiopathic hip osteoarthritis (2, 3). In addition, the term idiopathic hip osteoarthritis from morphological point of view is restricted to cases with lateral center edge angle between 25 and 39 degrees (4, 5). According to available data, idiopathic hip osteoarthritis is mostly caused by Femoroacetabular Impingement (FAI), which means there is a pathological impact between the femoral head-neck junction and the acetabular rim (2, 5-9). Femoroacetabular Impingement can be divided to pincer and cam type. The cause of the pincer type is focal or general over coverage (cranial acetabular retroversion or coxa profunda) of femoral head by acetabulum, whereas the cause of cam type is aspheric femoral head or head-neck junction. The pincer type typically occurs in females between age 30 and 40 years in contrast to the cam type, which manifests typically in younger males. In a number of cases, signs of both types are present and they are classified as mixed type FAI (7, 10). 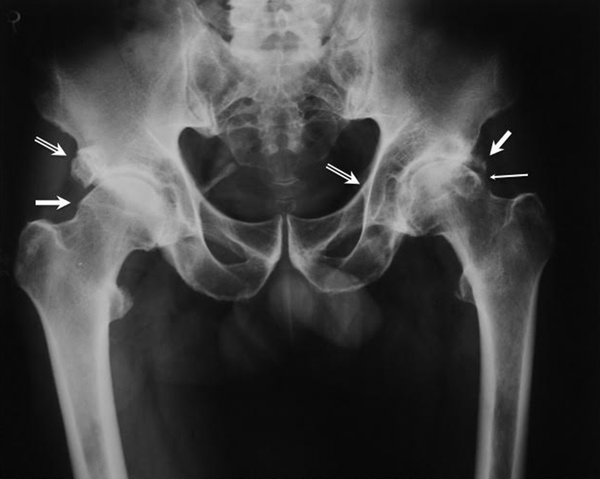 The aim of this retrospective study was analysis of FAI signs associated with idiopathic hip osteoarthritis from preoperative anteroposterior radiographs of patients indicated for total hip replacement (the operated and also the contralateral, non-operated hips with osteoarthritis) as compared to radiographs of patients without this indication (control group) and the radiographs of the patient’s non-operated contralateral hips without osteoarthritis. We examined the preoerative anteroposterior [AP] pelvic radiograph of 543 patients aged between 45 and 60 years, who had undergone total hip replacement between 2005 and 2012 at two different departments. 1. Evidence of hip conditions causing secondary osteoarthritis from personal history and patients’ documentation; 2, lateral center edge > 39° or < 25° according to Tonnis (5) (over coverage) and Murphy (4) (hip dysplasia); the center of the femur head was determined using a spherical template. The lateral center edge angle was measured between the vertical line running through the center of the femoral head and the line connecting the center of the femoral head and the lateral aspect of sourcil [medially to calcified labrum and os acetabuli]; 3, positional problems, such as excessive pelvic tilt and/or rotation or bad quality radiograph picture. The increasing tilt and/or rotation of the pelvis substantially alter the signs of acetabular retroversion (5). Due to the exclusion criteria listed above we excluded 328 patients from the patient group and 109 patients from the control group. After exclusion, we examined the preoperative AP pelvic radiograph of 313 hips (215 patients) in the patient group. In the control group (patients from the outpatient clinics with knee conditions) we examined the AP pelvic radiographs of 224 hips (112 patients). In both groups the patients’ age, gender, an body mass index (BMI) were also recorded. In the patient group we examined the operated and also the contralateral, non-operated hips with osteoarthritis (grade 2 - 3 according to Tonnis (11)). For correct diagnosis of FAI, an oriented AP pelvic radiograph is needed (12). We used the method of Siebenrock (13). The tube-to-film distance was 120 cm. The central X-ray beam was directed to the middle of the distance between the superior border of the symphysis and the horizontal line drawn through anterior iliac spines. The rotation of the hip can be excluded if the top of coccyx points to the center of symphysis, the acetabular teardrops and foramina, and the iliac wings are symmetrical (13). The tilting of pelvis is negligible, if the distance between the top of the coccyx and the superior border of the symphysis is less than 2 cm (14). 1, Posterior wall sign is positive if the line of the posterior wall is medial to the center of the femoral head (14). We quantified the posterior wall sign with the posterior wall distance (12), that is the horizontal distance between the line of the posterior wall and the center of the femoral head; 2, crossover sign is positive if the line of the anterior wall is lateral to the line of the posterior wall cranially, then crossing with the line of the posterior wall runs medially to the posterior wall caudally (15). We quantified the crossover sign according to the acetabular retroversion index (14). This is a ratio of the distance between the crossing point of the anterior and posterior wall and the superolateral edge of the acetabulum to the distance between the superolateral edge of the acetabulum and the crossing point of the ischium and the posterior wall; 3, Spina ischiadica sign is positive if the spina ischiadica projects inside the acetabular rim (in triangular shape) (16). The spina ischiadica sign is quantified by the size of the projected spina measured in millimeters. The posterior wall sign, crossover sign and spina ischiadica sign indicate acetabulum retroversion (pincer type) (15, 16); 4, Flattened femoral head and pistol grip deformity. The pistol grip deformity is the flattening of the normally concave surface of the lateral aspect of the femoral head-neck junction. Both flattened head and pistol head grip deformity indicate the presence of cam deformity (15, 17, 18). The secondary signs of FAI are ossification of the labral basis (10), os acetabuli (15) and herniation pit (19). Os acetabuli can be seen as a separated fragment from the surrounding bone; herniation pit is a 3- to 15-mm radiolucency surrounded by sclerotic margin in the femoral neck anterior proximal superior quadrant (Figure 1). Figure 1. Anteroposterior Pelvic Radiograph; On the right side, the ossification of the sacrospinosus ligament, os acetabuli (contoured arrow) and flattening of the head can be observed (thick arrow). On the left side the spina ischiadica sign (contoured arrow) cross-over sign and herniation pit (thin arrow) and labrum ossification (thick arrow) are indicated. The CEA is grade 38 on both sides. Statistical analysis was performed using the Student’s t test and the Spearman rank order correlation test. P-values below 0.05 were considered significant. The study was approved by the independent research ethic committee. In the patients group we examined the preoperative AP pelvic radiographs of 313 hips. The average age of 107 males and 108 females was 52.2 ± 5.2 (range 45 - 60) years, and the average BMI was 28.0 ± 5.1 (range 17.8 - 44.1) kg/m2. In the control group, we examined the AP pelvic radiograph of 224 hips (112 patients). The average age of 64 males and 48 females was 51.7 ± 3.7 (range 45 - 59) years, and the BMI was 27.1 ± 5.2 (range 18 - 43.1) kg/m2. There was no significant age and BMI difference between the patient and control groups. In Table 2 the distribution of the FAI types and the secondary radiological signs are depicted. Table 3 indicates the distribution of FAI types as well as the secondary radiological signs according to gender. Table 4 shows the distribution of acetabular retroversion signs in the examined groups. aValues are xpressed as No. (%). The mean posterior wall distance was 4.5 [2 - 8] mm. Considering the crossover sign of positive cases, the acetabular retroversion index in the patient group was 0.312 [0.15 - 0.66] while in the control group this was 0.211 [0.16 - 0.38]. In the presence of spina ischiadica sign, the size of projection of spina ischiadica in the acetabulum rim in the mentioned groups was 6.32 (20, 21) and 6.3 [3 - 8] mm. We considered the isolated presence of posterior wall sign positivity as a marker of posterior wall deficiency similarly to Giori (8) and Werner (22). A study of cadaver examinations by Jamali et al. (23) showed that crossover sign positivity is an indicator of cranial anteversion of < 4 degree and this is also in accordance with our observations. We considered the combined presence of posterior wall sign and crossover sign cranial acetabular retroversion, with the note that the cause of crossover sign can also be the hypoplastic posterior wall itself. According to Kalberer’s (16) examinations, spina ischiadica sign is also an indicator of acetabular retroversion. We can confirm this significant correlation between crossover sign and spina ischiadica sign because we found crossover sign in every case when spina ischiadica sign was present. The simultaneous occurrence of crossover sign and spina ischiadica sign is a sign of true retroverison of the distal hemipelvis. According to Werner (22), the combined presence of crossover sign, posterior wall sign and spina ischiadica sign is the most reliable indicator of acetabular retroversion. In our opinion the simultaneous presence of the crossover sign, the posterior wall sign and the spina ischiadica sign, can be an indicator of acetabular retroversion or posterior wall deficiency. In the patient group, posterior wall sign was recorded in 17 cases [5.4%]; in one case independently, which we considered as posterior wall deficiency, and in 16 cases with cam morphology (possible causative agent). According to Ipach, Giori and Ezoe (3, 8, 24), the occurence of the acetabular retroversion in control groups is 5% - 6% and in idiopathic hip osteoarthritis it is about 20%. In our study, these numbers were 3.1% and 51.4%, respectively. Similar to Tannast (10), the rate of pincer FAI in females was higher than males. Our results confirm this view; in the patient group, 38% were females and 18.6% males. Similar differences were found in the control group: 4.166% versus 0.7%. The rate of a cam type in asymptomatic volunteers, according to Hack (25), was 14% and according to Malhotra (26) was 11.7%, while this was 5.8% in our control group. The Copenhagen Osteoarthritis study (27) found the cam morphology in 27.4% of males and 5.4% of females, while in our study these values were 47.9% and 25% in the patient group, respectively. The occurence rate of mixed type in the patient group, similar to previous reports (7), was 28.7%, it was substantially lower in the control group (0.8%). According to the examinations of Cooke (20), the labrum ossification correlats with the cam type FAI; in our study the labrum ossification in the control group correlated with cam [R = 0.25], and in the patients group with both the pincer and the cam FAI [R = 0.168, R = 0.249]. Ranawat (28), regarding diagnostized FAI found 18% herniation pits in males and 2% in females while we noted 6.2% and 2.6%, respectively. In many aspects, our results differ from the data of previous studies. This can be caused by different factors, such as selection of patients and also ethnic factors. To the best of our knowledge, three previous studies (3, 8, 24) examined, using conventional radiographs, the relationship between acetabular retroversion and primary osteoarthritis, but in the mentioned studies the patient and control groups were substantially different from each other. From terminological point of view in agreement with Anderson (6) we suggest the use of the term secondary osteoarthritis caused by FAI instead of idiopathic hip osteoarthritis. Our opinion is based on the fact that in our study in 88% of patients, FAI morphology was present. Considering the weak point of our study (we did not examine by lateral radiograph the cam morphology, although we realized that for the diagnosis of cam type specialized lateral radiograph is necessary (28)) we assume that the rate of FAI is even higher. According to the study of Jager (9) there is more than a five-year delay between the appearance of the symptoms and the diagnosis of labral tears caused by FAI, though the early recognition of FAI and well-performed operations hinder the development of osteoarthritis and the hip would not reach a stage requiring prosthesis (2, 21, 29). Despite the fact that for objective measurement of acetabular retroversion, Computerized Tomography (CT) is needed (29) and for the diagnosis of labrum injury MR is needed (28), in the majority of cases, early diagnosis with simple, cheap, easily accessible AP pelvic radiograph with low dose of radiation can also be warranted and recommended. Financial Disclosure: There was no financial support.